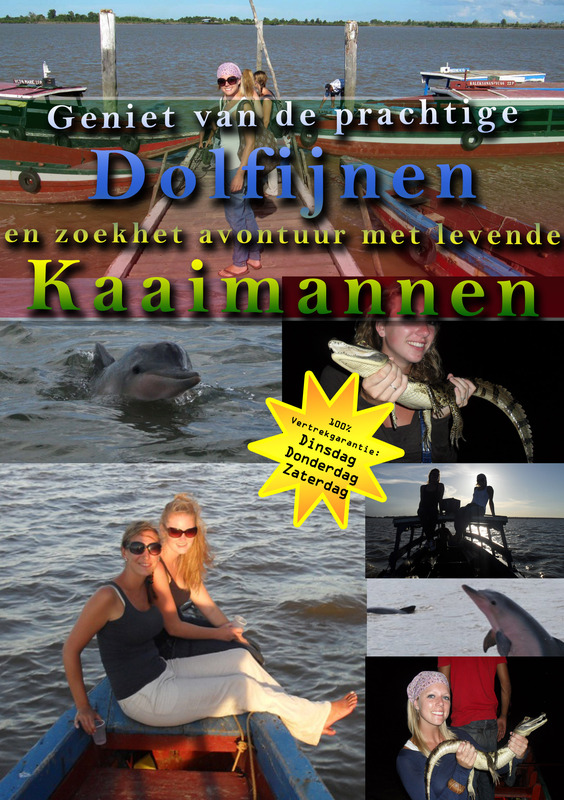 www.dolfijn-kaaiman.com Tour met Surinaamse dolfijnen en kaaimannen! 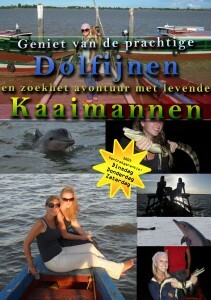 Booking of this tour can be online at http://www.dolfijn-kaaiman.com or at one of our sales locations! Unique in Surinam is the caiman and dolphin tour combination. This adventure is conducted by experienced guides and boatmen. You depart from Leonberg, you will get there on our special dolphin boat, from here we sail towards Braamspunt (sea). Here you can enjoy during the sunset, the playful surinamese dolphins . After the sun sets, we leave the dolphins and we head for Commewijne. Here we moor and we walk on the plantation “Johanna and Margaretha”. Here we eat a meal at an authentic Surinamese Hindoenstaans family. After the walk we step into smaller boats and we sail into the swamp (swamp). This is the home of the Surinam caiman. Here the boatman trying to catch an alligator for you so that you can hold him and make a photograph. After the photographs, the alligator, of course is released. The tour departs after a photo shot back to the plantation, then get back in the boat and we departs back towards Leonberg. Want to see the playful dolphins and caimans yourself? Elke dinsdag, donderdag en zaterdag 16.00 vanuit Leonsberg, Paramaribo. Diner, Guide, Snacks, Boatrides, Entree fees.